Current: The AquaGard 7100 Series is now available in DTools! The AquaGard 7100 Series is now available in DTools! Dorner’s AquaGard 7100 Series Conveyor is now available to configure in DTools! New to the 7100 platform? Here’s what you need to know. The 7100 Series is ideal for packaging, secondary packaging, dry food processing and corrosive environments. These conveyors are also built for flexible layouts. The 7100 can have multiple curves per conveyor, inclines & declines (up to 30º), and long runs. The three standard chain options all work on the same frame with no modifications. There are also specialty chain options available including: metal chain, grip top chain and cleated chain. The powered transfer option works on both the idler or drive tail end of the conveyor. It allows the transfer of parts as small as 2-3″ in diameter. A roller transfer is also available. Side transfers are another option for the 7100 conveyors due to the flush side tail design. The standard tails allow for a 1″ space from chain edge to edge. With a side transfer module, the chain is brought past the frame edge giving only a 1/8″ gap from chain edge to edge. 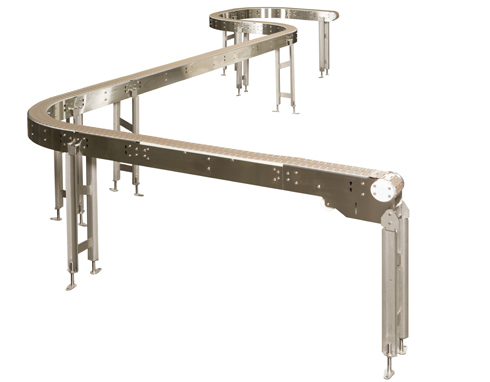 Learn more about these conveyors on the AquaGard 7100 product page. We have also updated our AquaGard 7100 Series brochure. It can be downloaded on our Literature Page.